Oz is newly arrived in the sleepy village of Slowleigh. At first, he wishes life there was more exciting, but drawing a moustache on a photo of schoolmate Isobel Skinner - nicknamed Psycho - might bring him the wrong sort of excitement. Someone else who's wishing her life was rather less exciting is his sister Meg, who's hiding a secret which Oz knows but her parents don't - can he survive Psycho and help his sister? At the time I read this, I hadn't got round to reading Cousins' 15 Days Without A Head, so this was my first experience of reading one of his books. It was very different from what I was expecting - the cover and blurb seemed to suggest knockabout comedy. While it's definitely a funny book, with some parts which made me laugh out loud, it's significantly deeper and more thought-provoking than I was expecting, with one particular topic that's very rare to see covered in teen fiction. 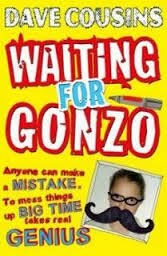 Oz, writing the book in the form of a message to the mysterious Gonzo, is a really good narrator and I thought the relationship he had with his older sister was especially well-portrayed. There are also some excellent supporting characters, notably Isobel - who when not terrorising Oz is actually really helpful to his mum, working as her assistant in creating sculptures after Oz accidentally causes her to break her arm - and Ryan, Oz's Hobbit-obsessed friend, whose hobby of taking part in battle re-enactments supplies much of the humour in the story. In addition, it's cleverly plotted and everything builds to an exciting and unpredictable climax which neatly ties things together. Despite it not really being what I was expecting, I definitely enjoyed this one and would certainly recommend it to people looking for a book which is both funny and thought-provoking. I'll look forward to reading more from Dave Cousins in the future!